Can You Pair Wine with Sushi? What qualities should you look out for? Sushi works well with certain varieties of wine – so you need to be looking out for these. Essentially, the standard rule is that the wine can’t be too dry, as it will clash with the fish. Similarly, the wine can’t be too sweet – think of the wine that is usually paired with Chinese or Thai food – as this swamps the fine delicacy of the fish. When pairing wine and sushi, you should be striving for a good balance between sweet and dry. A fine balance, integrity, good fruit and crisp acidities are all desirable qualities to look for in your wine. 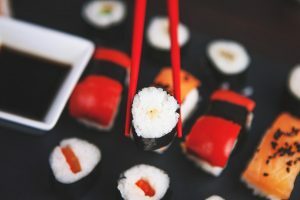 As a general rule, Rieslings of Germany and Alsace, and their New World counterparts make splendid companions for sushi. A salmon roll usually consists of cucumber, avocado and salmon rolled in rice and coated in seaweed. With these flavour combinations, you can expect fresh and light flavours. This means that it works well with a dry rosé. The salmon makes the tart cherry and citrus in the wine pop and its minerality turn to sweet brininess. A spicy tuna roll can pack a punch! Filled with spice, this tuna and rice roll offers plenty of flavour and heat, meaning your wine needs to be able to handle this. Our top pick for this is a very barely off-dry Riesling. As you need a big-bodied white for the meaty fish, this wine can handle everything. Riesling is mouth-filling, with sweet stone fruit to stand up to the spice and a mineral edge that loves the brininess of nori. A prawn nigiri is a simple offering. It is essentially a prawn placed over pressed vinegared rice. When thinking of a pairing for this dish, you’ll need to make the prawn your focus. We suggest choosing a Pinot Gris. The apple and aromatic stone fruit in the wine are perfect links to sweet prawns, with a hit of citrus serving as a spritz of lemon. It’s a perfect match! While it may not be the obvious option, pairing your sushi with wine can prove to be very delicious! While it may be a slightly harder match, the results can pay off big time. Why not try wine with your next sushi meal?